The best Norelco shaver has features that make shaving in the morning a pleasure. Most men dislike having to shave every day. That won’t be the case with a rotary shaver. They follow the planes of your face to give you the smoothest shave you’ve ever had in your life. Norelco shavers give you a ton of features, so you’ll be completely satisfied with your smooth face and everyone will notice a difference. Those who have sensitive skin won’t be irritated with their shaving routine when they switch to a Norelco. The best Norelco shaver for you is definitely on this list. There’s a comparison of features side-by-side, so you can see the important ones that will help you make a choice. 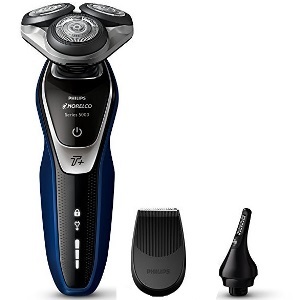 Why is Philips Norelco a Shaving Leader? What’s Involved in Changing the Norelco Shaver Head? 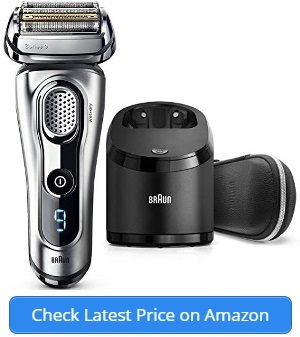 This shaver has 3 shaving heads that work independently for a close shave. With this flexibility, you can get along the jaw line and neck. You won’t have to twist your neck and hurt yourself to get a smooth surface for shaving. It’ll move along the angles and sharp curves of your face easily. Contour Detect – The contour detecting technology captures more hair with each pass. The blades don’t leave the surface of the skin. The contour detect moves in 8 directions to follow the angles and edges of the face especially around the jaw. It leads to a smooth, close shave every time. V-Track Precision Pro – The precision blades capture each hair individually. It doesn’t matter the length of the stubble that’s being shaved. The blades will capture and cut them without pain. The blades self sharpen, so you don’t need to replace the blades for a very long time. SmartClick Cleansing Brush – When you jump in the shower with this shaver, you can get a deep clean with the oil-control cleansing brush attachment. It’s a one-minute deep cleansing that controls facial oil better than manual washing. Digital Interface – One of the biggest advancements in shaving models is the introduction of the digital user interface. There’s a travel lock indicator, battery level, cleaning indicator, and motion sensor all displayed on the handle. The personal custom settings allow you to set the speed of the shave. There’s sensitive for a gentle shave. There’s normal for a quick, thorough shave. The fast setting gives you a quick shave to save time. There are many features that provide incredible benefits for the state of your skin. When you’re smooth and not irritated, you will look your best. It won’t take a trip to the barber or expensive visits to a salon to get a smooth, clean shave. It won’t even take you more than 20 minutes to get ready for your day. Take your wet/dry shaver into the shower, and use the scrubber on your face before or after your shave. The one shaver has all the features you need for a great shaving experience. Beard trimmer is a separate piece that needs to be attached. This shaver is extremely capable of giving you a close shave. It can used in the shower or on the run. The beauty of electric shavers is that they can be used dry. This one won’t tug on your skin while giving you a great shave. AquaTec Technology – The wet/dry technology means that you can shave without the use of any gels or foam. There are days you might need a quick shave without water. Other days, you will want a soothing shave that involves foam or water. You can bring this into the shower quite easily. SmartClean – The charging base is also a cleaning system. It uses an alcohol-free solution to clean the blades. It removes foam, gel, and hair from the shaving heads. The cleaning cycle involves a dual-filtration system that removes hair and basically sanitizes the blades for the next use. V-Track Precision Blades – The precision blades are self sharpening. They’ll give you a close shave day after day. The blades pull hair into the correct position before cutting. This allows for a more comfortable shave that’s very close to the skin. Contour Detect – There are three shaving heads on the 8900 shaver. Each shaving head moves independently. The shaver will always have a head in contact with the skin. Even when you move from the cheeks to the chin to the jaw, the heads can move in 8 directions to stay in contact. Beard Styler – The 8900 comes with a beard trimmer for those who want to keep a sharp, clean beard. It has 5 length settings, so you can choose the one that works for you. Whether it’s a short beard or stubble, the comb will keep the skin from becoming irritated. 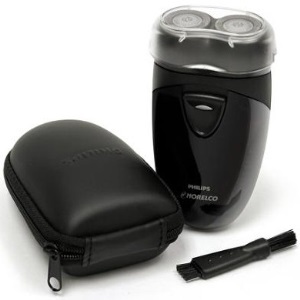 This Norelco 8900 is a wet/dry shaver that can be used in any circumstance. It comes with a beard trimmer, too. In the shower or out of it, this will give you a fantastic shave that’s incredibly close. One of the notable features of this shaver is the fact that it can easily be turned into a trimmer. You don’t have to buy an entirely new shaving system just to get a nice trim on your growing beard. It comes with 5 lengths built into the trimmer. While you’re letting your beard grow, you can keep it from getting wild. The shaver comes with a full, 2-year warranty if for any reason there’s a problem with it. 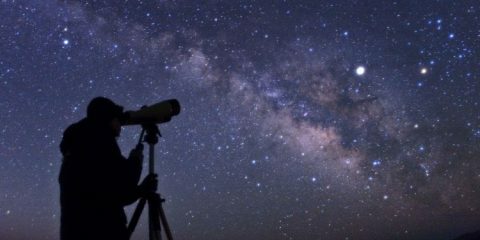 When a company stands behind their products, it makes sense to give them a try. The charging station needs a lot of counter space in the bathroom. The 9300 is one of the latest models from Philips. It has advanced technology based on customer feedback. For that reason, it’s one of the best shavers from a very popular brand. For the 9300, they thought of everything you could possibly need for a close shave. Comfort Settings – The Norelco 9300 comes with more functions and personalized systems than previous generations. There are 3 comfort settings in this shaver. There are slow, medium, and fast settings. The slow speed is for those with sensitive skin. The medium gives a more thorough shave. The fast speed is for a powerful shave. AquaTec Technology – The shaver can be taken into the shower with you because of the AquaTec Technology. You can also use gel, foam, and water for a close shave that won’t irritate the skin. The reasons you might need water and shaving cream will depend on your skin that day. It could be drier, and you don’t want to risk razor burn. Contouring System – The contouring system gives you a close shave without losing contact with the skin. There are 3 heads that rotate independently in 8 directions. The heads will never lose contact with the skin. You won’t have to go over the same area more than once. LED Display – The LED display will alert you when the battery is running low. You won’t have to guess at how long you have before you’ll need to place it in the charging station. This is great for days that you’re on the run and have to shave in the car on the way to work or a meeting. 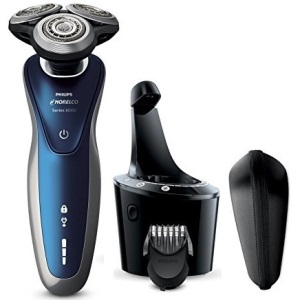 The 9300 Norelco shaver has the ability to shave a variety of skin types on your own face. While your cheeks might be a bit rough, the skin under your neck can be sensitive. The places where you might get nicks, cuts, or bumps need extra care. That can be done with the same shaver without having to change blades or settings. The combination cleaning and charging system takes away any added chores. You don’t have to worry about cleaning out the shaver. Just place it in the solution and turn it on. Once the shaver is cleaned of shaving cream and hair, it’ll dry itself before charging. Everything happens on its own. You’ll have a shaver ready for you next time you want to use it. The drying cycle does take some time. This rotary style shaver was originally called the PowerTouch Aquatec. It was revamped and repackaged to appeal to more people. 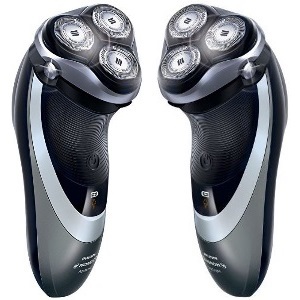 It will follow all the contours of your face like many of the Philips Norelco shavers. That will give you a consistently good shave every time you use it. Pivot and Float System – The pivoting system adjusts to the contours of the face. The neck, cheeks, and jaw line all have curves and angles that need a pivoting system. The heads will move along the contours of the face and neck without lifting from the skin. This gives you a close shave every time. DualPrecision – The length of the hair on the face can vary. The cheeks or the jaw might grow hair faster than other areas like the neck. The DualPrecision system will conquer the short stubble as well as the long hairs. You won’t have to switch heads or speeds to get the closest shave possible. AquaTec Seal – The AquaTec technology gives you the ability to have a wet or dry shave with the same electric shaver. That means the case and the head are enclosed and water won’t enter the shaver even if you take it into the shower with you. Pop-Up Trimmer – On the side of the shaver, there’s a trimmer built directly into the shaver’s case. To trim your mustache or sideburns, you’ll just have to flip the trimmer on the side. You don’t have to get another device or snap anything onto the shaver itself. It’s all contained in one device. The 4500 is a shaver with all the best features like wet or dry shaving options. It has safety benefits since it uses razor heads that will pivot and float easily on the skin. That will stop you from getting razor burn or irritating sensitive skin. It’s an easy-to-clean shaver, too. All you have to do is rinse the shaver under a running faucet to remove gel or foam from wet shaving. For dry shaving, you can remove the heads and brush stray hairs from inside the case. It’s quick and simple. The shaver even comes with a brush for that purpose. This shaver can’t be used while it’s plugged in and charging. In the 5570, you’re getting a shaver that will get really close to your skin. It will conform to the contours while doing its job. It’s especially efficient on the neck and jaw line. You can get as close as a razor with more comfort and ease of use. MultiPrecision Blades – The blades of this shaver don’t require you to make numerous passes across the skin. The blades will lift long hairs and raises those that lay too flat for other shavers. Flex Heads – The blade heads flex in 5 directions. When they flex in that many different directions, there’s constant contact with the skin. Close skin contact is how you get a smooth shave on the cheeks, neck, and jaw line. AquaTec Technology – The shaver has the ability to be used without foam or gel in a dry shave. It won’t irritate the skin. For those with sensitive skin, you can easily use foam or gel to smooth and soften the hair for shaving. It can be used in the shower, too. Click-On Accessories – The SmartClick Precision Trimmer and the SmartClick Nose and Ear Trimmer are included. These will give you a complete grooming session without the need for more devices. Just add them to the shaver, and you’ll be ready to head off to work or a hot date. Turbo+ Mode – The Turbo Plus Mode gives you a boost of power that can handle even a thick part of your hair growth. It gives 20 percent extra power beyond the already powerful shave. The 5570 shaver has accessories that make it an entire grooming system. Men won’t need more than one device when there are accessories that maintain your mustache or trim nose and ear hair. You can be clean and groomed quickly every morning. It doesn’t have to be a special occasion that sees you shaped up and clean. The Turbo Plus Mode can make quick work of any overgrown areas of your face. You might spend a weekend without worrying about shaving. On Monday morning, you’ll need to be clean and sharp for the workweek ahead. Your morning routine will benefit from the quick modes and easy accessories with the 5570 shaver. The shaver won’t run when it’s plugged in and charging. It’s important to keep it charged, so the shaver doesn’t stop in the middle of a shave. This is a wet and dry shaver that will get even the smallest hairs. Day-old stubble won’t stand a chance against this shaver. It follows every curve and angle of your face. That includes the small places like under the nose. It’s a close shave that won’t cause irritation, either. AquaTec Seal – The 6100 shaver has an AquaTec seal that keeps water from entering the inner workings. This will allow users to enjoy a quick shave while in the shower. A wet shave can also be done with shaving gel or foam. Those with sensitive skin can enjoy softer skin and easier shaving with a wet shave. SkinGlide Surface – A smooth surface is essential for the shaver to glide across the skin. The low-friction shaving surface will glide smoothly across the face. This leads to less irritation even in those who are prone to bumps and rashes from shaving. 27 Rotating Blades – The 27 blades of the shaver will lift and cut the shortest hairs. They’ll lift and cut flat hairs, too. The Norelco 6100 slides across the surface of the skin with blades that move with the curves and angles of the face. It’ll give you a close shave every time. LED Display – There’s much to see on the front of the 6100 shaver. There’s a travel lock that lets you know when it’s safe to store. There’s a two-level battery display, so you always know how much of a charge you have. The Shaver 6100 gives you a close shave that’s incredibly comfortable while it’s happening. The SkinGlide surface moves across the skin without friction. It’ll help you avoid irritation and rash like some other shavers. There’s a precision trimmer, so you can easily perform all your grooming with one device. It’s great for sideburns and mustache trimming. With one device, you can get a quick shave and a trim even while you’re in the shower. It won’t take hours to look your best. The trimmer is a separate piece that needs to be attached. While this is an older model of Philips Norelco, it’s a great one. The head moves easily to follow the curves of your face. It’s great for beginners to shaving. 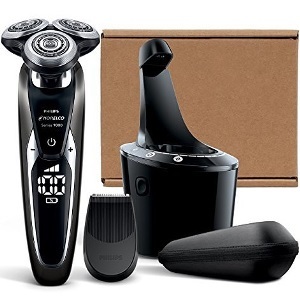 If your son needs his own shaver when heading off to college, this is a great one for him. It has self-sharpening blades and rinses easily. Flex and Float System – The contours of your face are what can cause problems with some shavers. The blades lift whenever there’s an angle or change in the plane of the surface. That’s not going to happen with this flex and float system. The blades maintain contact with the skin even when there are angles. Close Cut Heads – These are self-sharpening blades that don’t need to be replaced as often as other shavers. They’re precision engineered to stay sharp and effective. It doesn’t matter how many times you shave, the blades will be close and give a smooth shave every time. Pop-Up Trimmer – In the handle of the shaver, there’s a pop-up trimmer for beards and sideburns. It’s also perfect for shaving the back of your neck between visits to the barbershop. In some shavers, the trimmer is separate. This one has the trimmer built into the unit. Corded or Cordless Use – After an 8-hour charge, the shaver is good for 35 minutes of shaving. The quick shave from the 2100 means you can get a good shave for the entire week with that amount of shaving time. You can also use this while it’s charging, too. One of the best features of the 2100 is the fact that you can use it while it’s charging. Many other shavers don’t allow the unit to work while it’s plugged into the outlet. You won’t be able to use it as a wet shaver while it’s plugged in, though. The close-cut durable blades will give you an incredibly close shave. If you want a smooth shave that catches more hairs, this is the shaver you’ll want to purchase. It has a built-in trimmer for those areas that need slight trimming. The 2100 has everything you need for shaving on a daily basis. It’s an affordable shaver from a company that has specialized in quality shavers for many years. It doesn’t have technology that allows it to be used as a wet shaver. This is a shaver for the Star Wars lover in your life. It’s packed in a Star Wars box that’s a special edition. There’s no reason that your morning shave can’t be a fun experience. If you buy this for yourself, you’ll enjoy the features and the nod to your favorite movies. Turbo Plus Mode – The speed of the shave is lightning fast. With the Turbo Plus Mode, you’ll get 20 percent more power with your shave. That can be great for dense parts of your beard if you haven’t shaved for a few days. V-Track Precision Pro – Each hair is lifted and placed in the right position to be cut. The pro blades lift the hair gently even if it’s a few days old. The hair is put into the best position to be cut without pulling or tearing. This is effective for beards that are a few days old. Click-On Precision Trimmer – The trimmer clicks into place and gives you a clean line for your sideburns. It’s great for lining your beard or hairline. It’ll shave the back of your neck without a problem. Trimming your mustache is simple with this trimmer. LED Display – There’s a display right on the handle that will give you all the information you could possibly need. There’s a 5-level battery indicator. There’s a cleaning indicator and an indicator for when the head needs replacement. 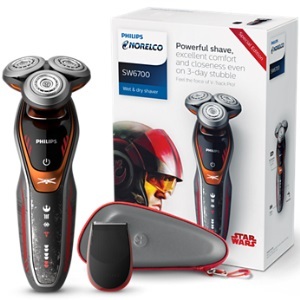 This special edition 6700 shaver is for the Star Wars lover who wants to get a smooth shave. It has 8-direction contour detecting to keep the blades close to the skin. This will catch more hair with each pass and stop you from having to pass over an area more than once. Continued shaving over and over in the same place is what causes irritation and bumps. The LED display that announces battery level and cleaning indicator is surrounded by small details that scream Star Wars. It’ll make shaving every morning a fun adventure. The Lithium-Ion battery gets 60 minutes of shave time out of an hour of charging. If you need to have a fast shave, you can spend five minutes waiting on a charge. This will give you a quick shave before you head out the door. The shaver makes a lot of noise when performing. The 3D shaver is fantastic for people who haven’t had much experience with electric. It’ll gently remove hair from all over the face. Even areas like under the nose and the jaw line. Those challenging parts of the face aren’t a problem for the 3D. Wet/Dry Technology – The Philips Norelco technology that lets you take this shaver into the shower is called AquaTec. It’s a seal that will keep water from splashing on the inner workings of the shaver. You can also use shaving foam or gel with the shaver, too. 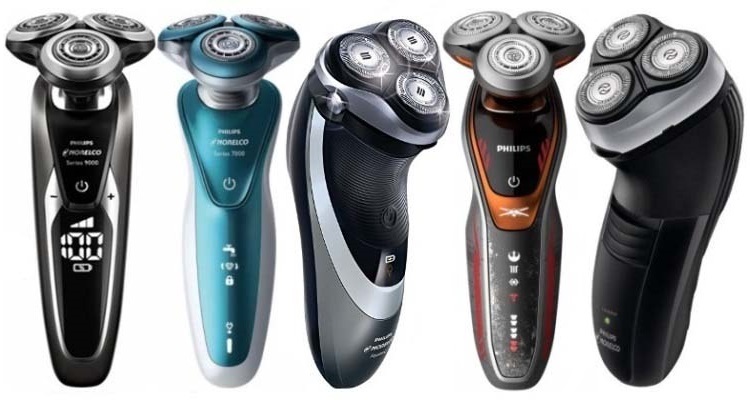 GyroFlex 3D – The shaving heads of the 8100 will contour in 3 ways for a close shave. In order to stay close to the skin, the heads will pivot, flex, and tilt. This allows the shaving heads to stay in contact with the contours and angles of the face. UltraTrack Shaving Heads – Each shaving track will lift and catch the hair. Even those hairs that are different heights will be caught in the three shaving tracks of the UltraTrack heads. SkinGlide Surface – When a shaver doesn’t have a smooth, gliding surface, it can cause irritation and shaving bumps. Some men are more prone to irritation than others. The SkinGlide surface will move smoothly across the skin without dragging. 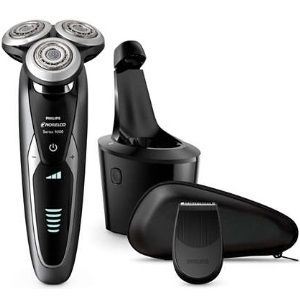 There are many features of the 8100 that makes it a great shaver for men. It’ll provide a comfortable dry shave with its SkinGlide surface and UltraTrack shaving heads. The shaver head will glide across the contours and natural angles of the face without causing any irritation. There’s nothing worse than a dry shave that feels harsh and irritating when you’re done. The AquaTec technology means that you don’t have to use this as a dry shaver if that causes too much pain. Some men really need the softening of shaving gel or foam. You can take this into the shower with cooling gel and get the greatest shave you’ve ever had. The 8100 has many other features like the pop-up trimmer attached to the shaver itself. There’s also accessories like the travel case that make this your go-to shaver when on vacation or a work trip. The charger shouldn’t be used as a stand for the constant charging of the shaver. This is a travel shaver for men who don’t want to drag their at-home shaver around. It’s compact and easily able to handle your tough hair. Just because it’s compact doesn’t mean you have to sacrifice quality. This travel shaver can be a good gift for a teenager learning to shave, too. Close-Cut Heads – The 510 shaver gives a close shave every time. It has the same technology that pulls the hairs into the grooves and stands them up for a cut. It’s an electric shaver with blades that won’t need to be sharpened. Travel-Friendly – This is a perfect shaver for travel. It’s compact and easy to pack with your other toiletries when traveling anywhere in the world. There’s no worry about voltage for the operation of this device. World-Wide Voltage – This shaver can completely ignore the voltage concerns of any country where you’re traveling. It won’t need to be charged since it runs on two AA batteries. Place fresh batteries in the shaver at the beginning of your trip. You’ll be clean-cut the entire time you’re away on vacation. Independently Floating Heads – The floating heads will move independently of each other. This gives you a shave that floats along the contours of your face. Your face curves and has angles around the cheeks and the jaw line. You’ll get a close shave with the floating heads. This compact, little shaver has all the greatest parts of the Norelco line of shavers in one small package. The shaver can be taken with you anywhere in the world. That can’t be said for most of the shavers you might consider purchasing. In fact, many people have a full-size shaver at home with this one stashed in their travel kit. It has floating heads for a shave that gets incredibly close. Each head will move in a direction that makes sense during your shave. It’ll give you a smoother shave that won’t irritate the skin. You won’t have to make as many passes to get all the hairs on your face. It comes with a full 2-year warranty. The shaver also comes with a brush for cleaning. You can pull off the top of the shaver and brush out all the hairs after shaving. It doesn’t require a huge cleaning process. It can’t be used as a wet shaver. The blades of the Norelco shavers are meant to give a closer shave with fewer passes. The precision blades lift and cut. It’ll work with different hair lengths, too. The precision blades shave flat hairs that need to be lifted and short stubble without a problem. The shavers from Norelco come with a ton of accessories. They include things like travel pouches, precision stylers, and docking stations. You’ll never have to buy an accessory from a competitor or other company to fit with your Norelco shaver. There are accessories like brushes that will help you clean your shaver flawlessly. It’s easy to clean the Norelco shavers. There are docking stations that will clean and lubricate all the parts as it dries. You can easily rinse most of the hair from the shaver by running it under the faucet. For a more thorough cleaning, you can use the brush that most shavers have included in their box. There’s no real maintenance that will have to happen to keep the shaver good for a very long time. It’s important that the angles of your face get the attention they deserve. This contouring of the face can be a problem for some kinds of shavers. Norelco has a contouring system that takes into account the fact that every man’s face has a unique shape. Those with sharper lines and angles will appreciate the shaver that hugs the curves and angles for a close shave. Wet and dry shaving means that you’ll be able to use your electric shaver with shaving cream or without. It doesn’t necessarily mean that you can take it into the shower with you. Although, some lines have that ability. The Norelco line has shavers that can be used with water, gel, or foam for a soft, close shave. The battery allows you to charge the shaver. You can take it with you on the road wherever you may need to go. The charge can last anywhere from 10 to 14 days of shaving – or 40 minutes of shaving. The battery should last the life of the shaver. The pivoting head allows a smooth shaving action from the face to the jaw line to the neck with one motion. It’ll allow for close shaving without any missed spots. You won’t have to remove the shaver from your face to get under the angle of your jaw. That’s because the head will pivot to keep in contact with the skin. It would be incredibly amazing to have all your facial hair growing in the same direction at the same rate. Unfortunately, your hair can lay flat or grow wildly in opposite directions. The Norelco shaver will lift the hair away from the skin and hold it in place before cutting. This will leave behind a smoother shave with no missed areas. For the smoothest, softest skin without hair, you need a shaving ritual. Most of the time, shaving begins with a routine before switching on the shaver. The best way to get a good shave is to do a wet shave. This will begin with washing and exfoliating your face. It keeps you from getting ingrown hairs. Razor bumps and irritation usually occur because you’re not preparing the skin. You can take a shower and use a facial scrub before shaving. This removes old, dead skin cells. It’s important to use a shaving cream or gel for your shave. Not only does it make your skin soft, it softens the hair. Instead of hair breakage, you get a clean cut with your shaver. Using the gel or cream is a personal preference. The gel or cream can be massaged into the skin. It’ll lift hairs that normally lay flat, too. You don’t want to use too much, though. It should be a single layer that’s massaged into the skin. The shaver should be fully charged before you begin. 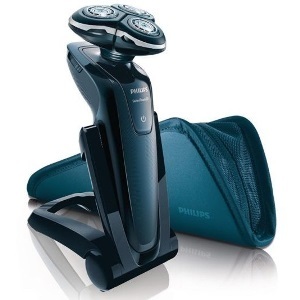 The rotary shavers from Philips will work even if they’re not fully charged. You just don’t want to rush the process. Once you’re ready to begin, place the shaver against your skin. The shaver should be moved in circular motions on the face. You can also go up and down or side to side. It helps to vary the shave to get all the hairs. There’s no need to press down on the shaver. Allow it to move smoothly on its own. It’ll work better when you apply less pressure. It’ll only lead to irritation and painful skin if you press too hard. After shaving, rinse the head to remove hair and lather. It’ll keep your shaver in good condition. It’s pretty simple to change the shaver head. You’ll press down on the buttons on the bottom of the shaver head. It flips open for cleaning and maintenance. You can completely remove it for replacement, too. There will be a clamp piece holding the blades in place. That needs to be turned counter clockwise to be removed. The circular blades will simply pop right out of their spaces. To replace these cutters, it’s easy to drop the new blades into the same holes in the head. The clamp piece, or cutter lock, will need to be refastened. The loops go over the cutters. A clockwise twist will lock them into place. Finally, the cutter head can be placed back onto the shaving handle. It will click back into place. Part of maintaining your shaver is cleaning it properly. For some models, you’re getting a cleaning station. Others do not come with a cleaning station. With a cleaning station, it’s easy to place the shaver inside for self cleaning. Other shavers need to be rinsed under a faucet. All Norelco shavers are able to be rinsed without being submerged. Turn on the shaver before placing it under the running water. That will remove some of the foam and hair. It’s important that you go a bit further, though. You flip open the top of the shaver by pressing the buttons holding it. When it’s open, run the top of the head through running water. This removes more of the hair from the cutters. Excess water should be removed from the shaver. You can shake it lightly to remove water. It’s best to leave the shaver to air dry. 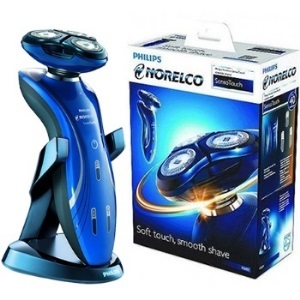 Norelco shavers began their life under the umbrella of the Philips company from the very start. The company started their electric shaver line in 1939, but weren’t able to introduce them to the world for years. This was the time of World War II, which delayed sales until 1948. The shaver company didn’t become popular until 1951. That’s when they manufactured a model with two rotating heads. The company had a rocky start with their shavers and other products from the very beginning. The company was stopped from using the name Philips on any of its products. The Philco company was already in existence and didn’t want the company’s products to be confusing to the public. The names were judged to be too similar. Philips had to start using another name on their products. They came up with the name Norelco as an acronym for North American Philips Electrical Company. Eventually, the company was able to buy Philco in 1981, but they were well-known as Norelco shavers. They didn’t change the name since it was already popular among customers as a great shaver. 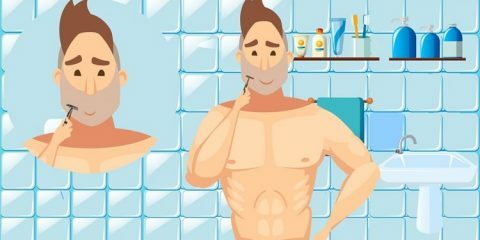 Is the Norelco shaver good for sensitive skin? The Norelco shaver is perfect for sensitive skin. It allows the man to use shaving cream or gel to ensure a smooth shave that won’t cause razor burn on sensitive skin. This is due to the Aquatec system. Does the Norelco shaver have replacement heads? Many models have replacement shaving heads available. Over time, the blades of your shaver will need to be replaced to ensure that it’s giving you a clean shave. New models have replacement reminders built into the shaver. You won’t have to wonder if it’s time for a replacement. Can the Norelco shaver be taken on vacation? The charge on the Norelco lasts for almost 2 weeks depending on the amount of shaving you do each day. The minimum amount you’ll be able to run the shaver is 50 minutes. That’s a quick 5 minute shave each day for 10 days. You can also bring the charger and docking station with you. Each shaver comes with a travel pouch. How are the Norelco shaver and a foil shaver different? The Norelco shavers are rotary shavers while foils are a different kind of shaver completely. A foil shaver has rows of razors behind mesh. The blades move quickly to cut the hair like scissors would. A rotary razor has angled grooves that lift and cut the hair with blades. Is the Norelco shaver good for shaving a person's head? A rotary razor is used for tight areas with curves like the jaw line and the neck and cheeks. It has a flexible head for moving around without losing contact with the skin. The Norelco shaver has a rotary option that works well to shave a man’s head. There are also foil options that work for larger areas for a clean-shaven look. Will the Norelco shaver work with universal voltages? The shaver works with 100V to 240V. If you’re unsure about the voltage of the country you’ll be visiting, charge the shaver before you leave. It’ll last for up to 10 days on one charge. You can also buy an adaptor for the charger itself depending on the model. A Norelco shaver has all the features you could possibly need for the perfect shave. You always want to look your best. These shavers can provide that for you. It won’t take a ton of time to get a smooth face, either. The shavers are meant to appeal to a vast majority of customers. The company has listened to their customers’ feedback. They provide a great shave whether you have soft hair or coarse, too. 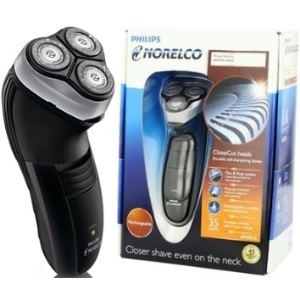 You can’t go wrong with a Philips Norelco shaver in your life.